Use Tripp Lite's P005-006-14RA in server applications that require a higher rated, heavier gauge cable, and in which space is in high demand. The right-angle C14 connector on this power cord is perfect for saving space in tight areas, such as in the back of your rack enclosure cabinet. When plugged in, it seats flush against the back of a device (e.g. PDU, UPS, etc. ), providing space for your rack door to close, or additional room to organize a tight area. C13 to Right-Angle C14 connectors, 3 x 14 AWG conductors, 15A rating, 100-250V, SJT jacket. Don’t settle for less than the best—enjoy superior Tripp Lite quality! The P005-006-14RA 6-ft. Heavy-Duty 14 AWG Power Cord with Right-Angle C14 Plug is an ideal solution for space-restricted network applications that require higher rated, heavier gauge cables. With a right-angle C14 connector on one end and a straight C13 connector on the other, the P005-006-14RA fits in tight spaces to connect network devices that use a removable power cord. The right-angled C14 connector makes installations easy in hard-to-reach spaces like the back of rack enclosure cabinets. 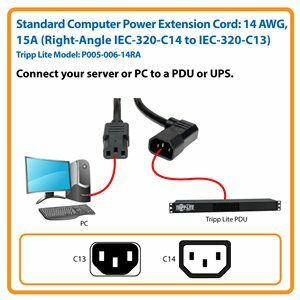 Simply connect the C13 end to a server component and connect the right-angled C14 end into a PDU, UPS or AC outlet. When plugged in, the P005-006-14RA sits flush against the power-source device to provide additional space for closing rack doors while also allowing for additional room and improved organization inside crowded areas. Unlike cut-price power cords, the P005-006-14RA is manufactured using superior materials and is tested to UL standards 62 and 817 for optimal product safety. The high-quality connectors are designed for reliable service and long life. We’re so confident of the quality of our P005-006-14RA Heavy-Duty 14 AWG Power Cord that we warrant it to be free from defects in material and workmanship—for life! As part of Tripp Lite’s commitment to environmental responsibility, the P005-006-14RA minimizes the use of hazardous materials and meets strict RoHS specifications.